Spoiler alert: This isn't my dream brick floor in an English cottage on a sheep farm. Or a villa on my lemon farm in Italy. Whatever. Sometimes a girl has to improvise and create the home of her dreams in a mid-century colonial in Tennessee. I don't even care because this might just be my favorite project ever. I know. I know. You've heard that before, but y'all, this time I'm serious. I was so excited about this project that I broke the number one rule of wifedom: when your husband offers to buy you something you should let him. 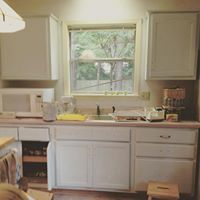 I turned down black and white square tile (my other floor fantasy) because I adore exhaustion, sore muscles, and scrounging around for some expired muscle relaxers in my medicine cabinet at 2 A.M. Speaking of husbands, if you need to do this before he realizes what's up, read Guerilla Decorating: A 5 Step Guide to Decor-Revolution. 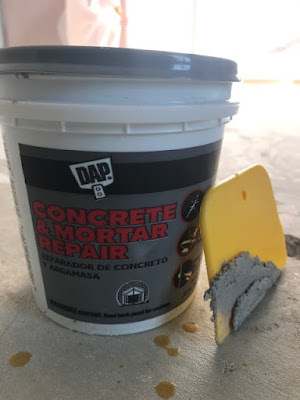 If you missed the previous post about prepping to paint concrete, you can read it here. I think I left out that part of the prep is definitely going to be creating a sample board to nail the color combo down. Obviously so you can then completely ignore it. When I imagined doing this project I envisioned a regular size paint roller on the end of a pole where I would knock out this floor painting business before lunch. Oh, wait. I forgot who I was. I should have known I would want to paint each individual brick a different color to achieve the most realistic look possible. Note: If you were painting a floor all over for a smooth finish the prep work would be much more intense. For this project, I used the imperfections to mimic actual brick. Plus I do not like intense but can completely get behind imperfect. 1. Clean and prepare the surface. This includes using premixed concrete to fill holes created when the carpet was removed. Sand the patches smooth after they dry and sweep up any dust and dirt. I swept and then used a shop vac. 2. Lay out the stencil according to your design. 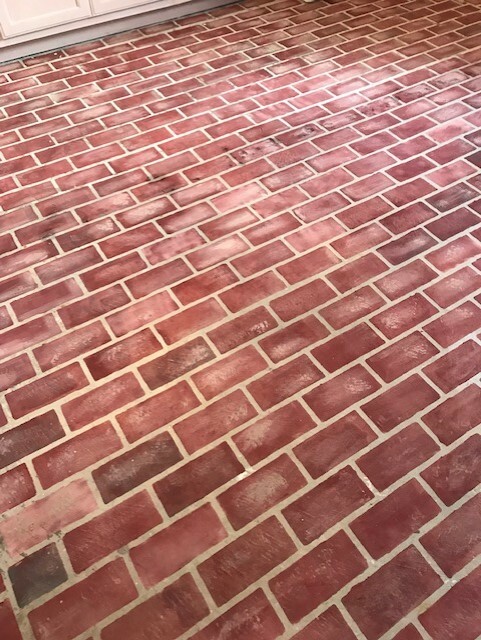 For this floor, I wanted an edge of straight brick which I thought looked more authentic than a brick pattern that just disappears under a wall. 3. Choose and mix paint colors. This depends on the color of brick you are trying to recreate. The outside of our house is red brick but I wanted a good bit of pink to tie in with the cabinets and countertops. The base color was Jolie Terra Rosa, with hints of Sage, Legacy, Palace White, and Rose Quartz. Have y'all figured out that I'm just making everything up as I go along? 5. Distress. 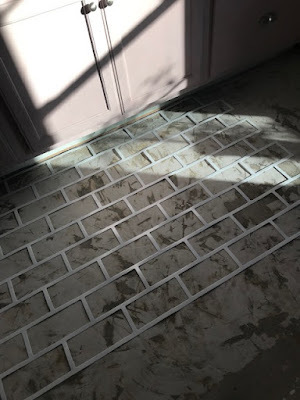 When the basic painting was done I flicked paint, mixed up a whitewash and spread it out in various spots to mimic extra grout, and sanded to achieve a flat clay like finish. 6. Seal with concrete sealer if desired. I'm in a holding pattern on this part because I am so happy with how the faux brick turned out and I don't want to ruin it by adding shine. Also, I'm not sure I'm done doing things to it. I'm on the hunt for a completely flat/no shine/matte sealer for concrete. I mean let's just toss aside the idea that the point of redoing the floor at all was to seal it and make it durable. 7. Enjoy your new floor! Because Jolie paint dries on concrete so quickly you can replace furniture and walk on it the same day. Actually, you can walk on it pretty much immediately. Remember when I painted the porch and it took days to dry? Not this time! Note: for all of you people I see posting on social media to ask about who has a good full body workout, look no further. Even though the cottage floor project was physically challenging because I got up and down off the floor 5,728 times it turned out even better than I expected. The other various colors of paints I had already in sample sizes. 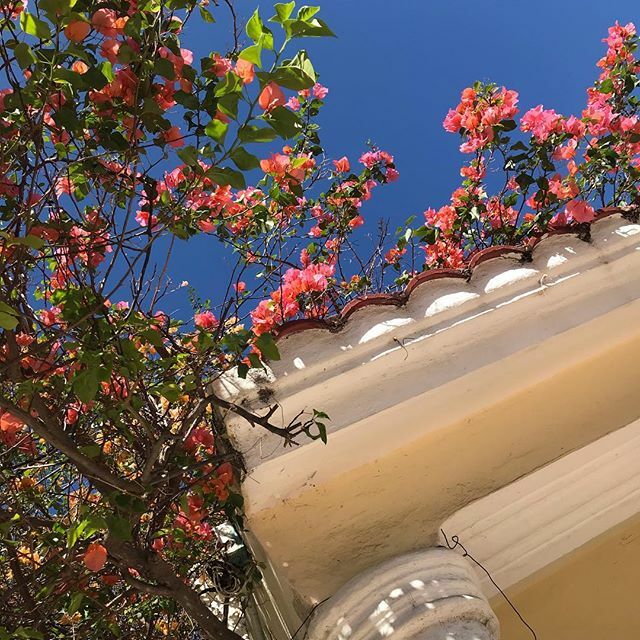 Colors mentioned above. The total was less than a hundred bucks but I did already have the necessary tools like the mini roller and sandpaper. This project start to finish took a solid 5 days from moving the furniture out to putting the furniture back. In the pro column for this project is the fact that If I get tired of this faux finish the floor is ready to put tile down. It was inexpensive and gives you a lot of visual bang for your buck. The only con was the labor. But it's like having a baby. As soon as you see it you forget all the pain involved. Sometimes in the midst of a daunting project it helps to look back on how far you've already come. Please remember to take before pictures of your projects! Later you'll be so happy you did! I love a good hideous before pic. 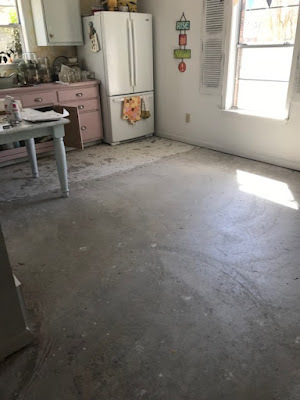 If you have been reading along with me for a while then you are familiar with the amount of whining and procrastination involved in my trying to decide what to do about the floor in the kitchen and living area of the guest cottage. I just couldn't face pulling up the carpet and linoleum myself even though I did that in our entire house twenty years ago. We paid someone to do that part and I was left with an ugly concrete floor. Or as I saw it, a blank canvas. For full insight to my procrastinating ways Read The Concrete Floor Chronicles. Last year I had ordered a giant brick stencil because I have always wanted to paint a floor. Weird. I know. And plus I really do love the whimsy of a faux finish. This space where I overwinter plants and sling honey and process beeswax is the perfect place for painted and sealed concrete. This is a workspace for me, so a practical durable floor was the main goal. Nothing about this photo says "Yes, carpet is a great idea for this space!" In an upcoming post I'll be sharing about the floor how to and reveal but first let's look back on how far I've come with this space. Here is the before before. You know, the before, before this before. Read about the real beginning of this project here. I wish I had taken a picture of the carpet and linoleum but it looked so bad that as you can see in every picture I'm working hard not to show it. Anyway here is the before. The before after the before above and before the before in the coming reveal. That's clear, right? Anyway, at some point in the process, it looked like this! 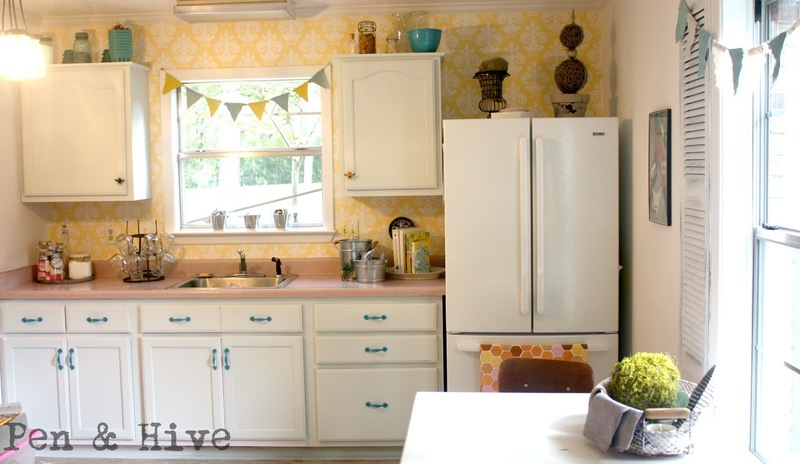 Read about how I dealt with pink countertops: Pink Countertops Aren't just for Barbie. I did find this one photo with some of the carpet in it. I know it doesn't look that bad but this side of the room was the cleaner one. This was before I painted the hutch. 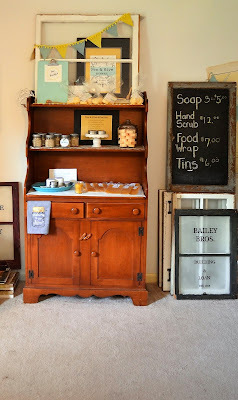 Read How I Gave My Hutch a Vintage Update. As you read it notice how cleverly I avoid the carpet in every photo. Here's a pic to give you a sense of the size of the stencil I'll be using. I've had this stencil for a year. That's how scared I was of this project. Here are some more photos of the floor sans carpet and linoleum. This is the part of every project where I think "What have I done?" You can't go back and moving forward is scary. It's just part of the process! Do not be intimidated by the ugliness. In the case of this project, I'm actually going to be using that ugliness to my benefit. I was so busy recovering from the January of Hacking and Project February that I never wrote about our mid-winter cruise to Mexico. It was a trip that grew from us and another couple to a group of ten. Now on any other kind of trip, I'd say ten is far too many. Too many to get seated in a restaurant without reservations, too many to even get a consensus on where to eat. Plus in a group that size, you can just about bet at any given time someone won't be happy. All of which makes a cruise the best option for a large group of people. You hate the stand-up comedian? Go hear some music instead. You're too tired to go to the show after dinner? Go to your cabin and read a book. You've had enough of being sociable (where are my introverts?) find a quiet corner and people watch. And the same principles apply in port. If everyone's going shopping and you want to snorkel, you can do that. Every person could actually do a different activity during the day and end up back at dinner together to share their experiences. Did you miss last year's girls' trip? Girls Gone Mild: who knew we liked rap? 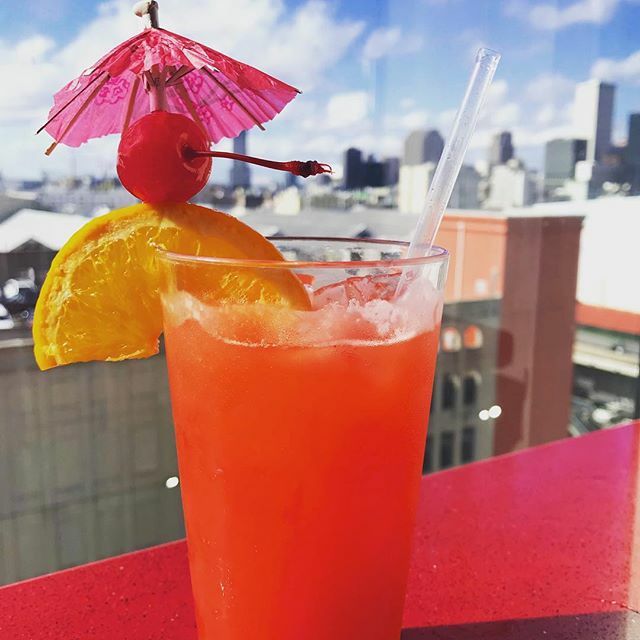 Train to NOLA: This is one of the things we love about this trip. Yes, you have to get up at the crack of dawn but once you are on the train you can relax and start your vacation. 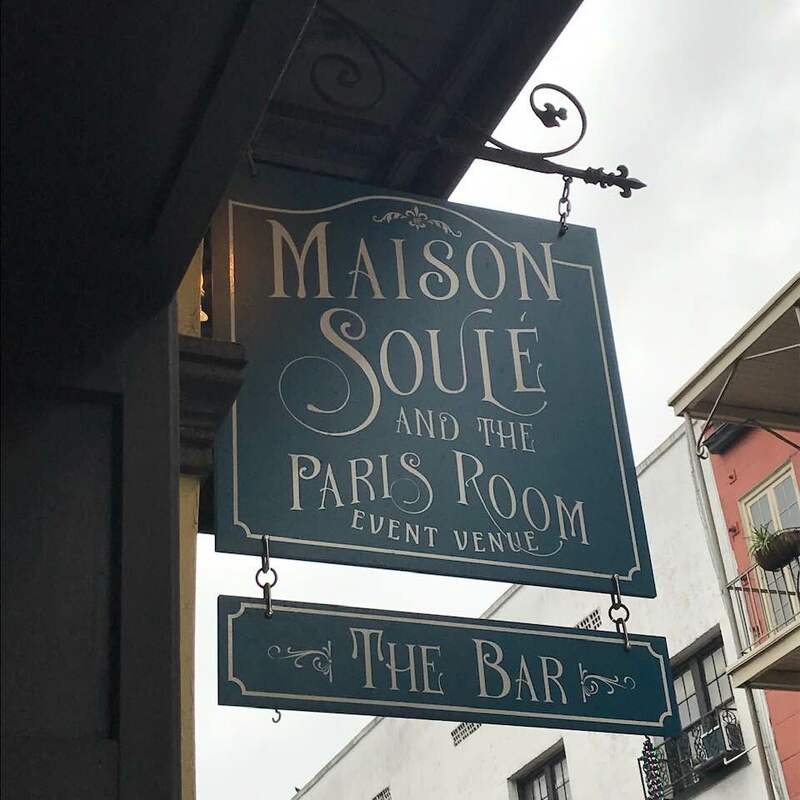 It has the added benefit of not having to drive or park a car in the Big Easy. Consulting an app to find a restaurant is a waste of time. The standards for food are exceptionally high and in 33 years of travel, we have literally never had a bad meal. A restaurant putting out subpar food just isn't going to make it. We have a few places that have been our favorites over the years but we also have great success just walking around and trying new places. Honestly, you can't go wrong. Some of our old standbys have been: Red Fish Grill, Acme Oyster House, Menas Palace, 21st Ammendment, and the Bombay Club. 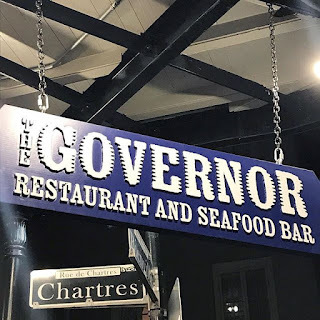 But on this trip, we stumbled upon The Governor, which was awesome and I took the ladies to one of my and my daughter's favorites, Maison Soule the next morning for breakfast. Bottomless mimosas? Yes, please. Well done, Carnival! The most seamless and hassle free check-in and embarkation ever! I had that one burger I let myself have every year from Guy Fieri's as we set sail and watched the skyline fade into the distance. It's a fascinating ride down the river to the gulf that takes about five hours. You see things from the ship that it's impossible to see any other way like the Domino Sugar Plant. Sailing across the Gulf of Mexico means a whole day for relaxing, touring the ship, and doing whatever fun activities are going on. This night is also dress up night and it's fun to see everyone decked out in their finest. It's a people watching extravaganza! This was a day of shopping, eating, and drinking. Mostly shopping. You have to love a place where when you are shopping they offer you shots of tequila. I mean that's a brilliant business model. And very effective if my last Visa bill is any indication. More eating and drinking. Then massages on the beach. If you'd told me I'd ever be laying face up on a public beach in my bra I'd have called you a liar. This was the day I had so much fun dancing on the deck my feet caught on fire. Okay, let me explain. The music in the club every night had been abysmal so no one had hit the dance floor. So on deck when they bust out the Cuban shuffle and YMCA my friends and I were all over it. Now I did notice my feet felt kind of hot. And as I looked around I made a mental note that everyone else had on flip flops. When I sat down my feet still felt really hot so I looked at the bottoms of them. Blisters. Big ones. And red burn marks. Cue This Girl is On Fire. My husband went to the infirmary to get me some medication to put on them which helped but I walked like I was 110 the rest of the day. Moral of the story: put some dang shoes on when dancing on a sun hot surface. The train ride home: I love Amtrak's little roomettes. It's perfect for when you aren't going far enough to get a real sleeper car, but need a door that closes because you're an introvert and have far exceeded your social interaction quotient for the week. This week is the ten year anniversary of the most magical trip I've ever taken. 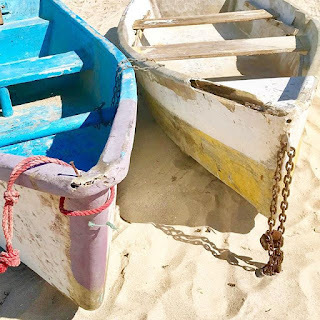 Read about my first visit to Italy: Why I Always Celebrate the Ides of March.